New Years Eve and Halloween. Two holidays that have never really been my favorites. (Of course as a child who was not allowed to have candy, Halloween was pretty much the greatest day on earth as I could “legally” eat a Snickers bar and no one could yell at me.) I guess, I don’t love them because there seems to be a pushiness, a kind of manic anxiety about the amount of fun that should be had on those two nights. While I am all for fun, I am against forced fun — I find it aggressive and weird, like when a dentist gives you too much nitrous and you feel smothered by the effect. Here in Japan, New Years Eve, while celebrated, is not the pinnacle. Instead, New Years Day (and the days that follow) is the most important holiday of the year. Most stores and restaurants close down. It is a time set aside for family, a kind of hibernation where you try to set the tone for the new year by being relaxed, being happy and hopefully laughing a lot. It is considered bad luck to labor on New Years day so there is a traditional set of foods called Osechi that are eaten at this time. The foods all have meaning — for example, kazunoko (herring roe) is always served as the thousands of eggs represent the good fortune of having lots of children. All of these dishes are meant to be prepared ahead of time, so that you can kind of laze about and eat them without any stress at all. They are beautiful, elegant, textural and unfortunately not my favorite thing to eat (you can’t win them all!). The other thing that you do on New Years is going to a shrine to gather up some good luck. We made our way via bicycle to the shrine in Hikawadai on a simply glorious day — clear blue skies with a warming sun shining down on us. As I have mentioned before, the shrines in Japan have an eerie power: they are odd, unchanging oases of something ancient hidden right in plain sight. The Hikawaidai shrine is a particular favorite. It is located on a hill surrounded by tall bamboo, so you can’t even notice the temple until you start up the steps, passing through tall cedar gates. 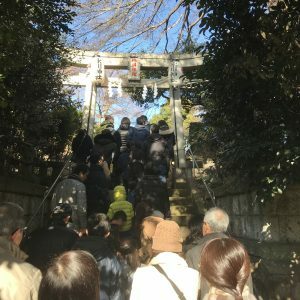 The area is residential, on most days, quiet and yet the shrine was packed on New Years Day, a line of people snaking around the temple grounds and into side-streets making for an hour-long wait. It is moments like these that the modernity of Japan falls away and you find yourself partaking in something really old, something that pre-dates rationality. It doesn’t take much imagination to know that this same scene would have played out (minus the Louis Vuitton handbags and selfie taking) thousands of years ago. As a guy with not much history or tradition, I find I’m a total sucker for these rituals. We waited in the line, the call of a crow echoing from the trees, cleansed our hands in the temple waters, made our prayers/wishes as incense and the smoke from a bonfire of last year’s good luck charms wafted over us. The temple grounds were alive with fortune tellers, charm merchants, flower sellers, food vendors and someone serving up warm cups of amazaka, a sweet, thick drink with just a touch of alcoholic kick. We emerged into the modern world refreshed, secure that whatever ancient spirits still rumble about in the soil and air of Japan would have our backs for 2018. I like this type of New Years thing. It is nice to have no expectations other than hanging out with your family and basically taking time to appreciate them and the fact that one is lucky enough not to be alone, living in a SRO in Camden, New Jersey. Or, for that matter, watching groups of grown men and women stumbling around on your quiet Brooklyn block, in light-up 2018 glasses screaming “HAAAAAAPY NEW YEARS!! !” as they vomit on your stoop with a look a deranged disappointment. So glad to read this beautiful note about Japanese new year’s custom through your perspective! !